Aqua Uno 34-inch x 58-inch Frameless Pivot Tub Door in Brushed Nickel is rated 4.5 out of 5 by 123. Rated 5 out of 5 by William from Easy installation. Curved glass improved modern bathroom design. ... Easy installation. Curved glass improved modern bathroom design. 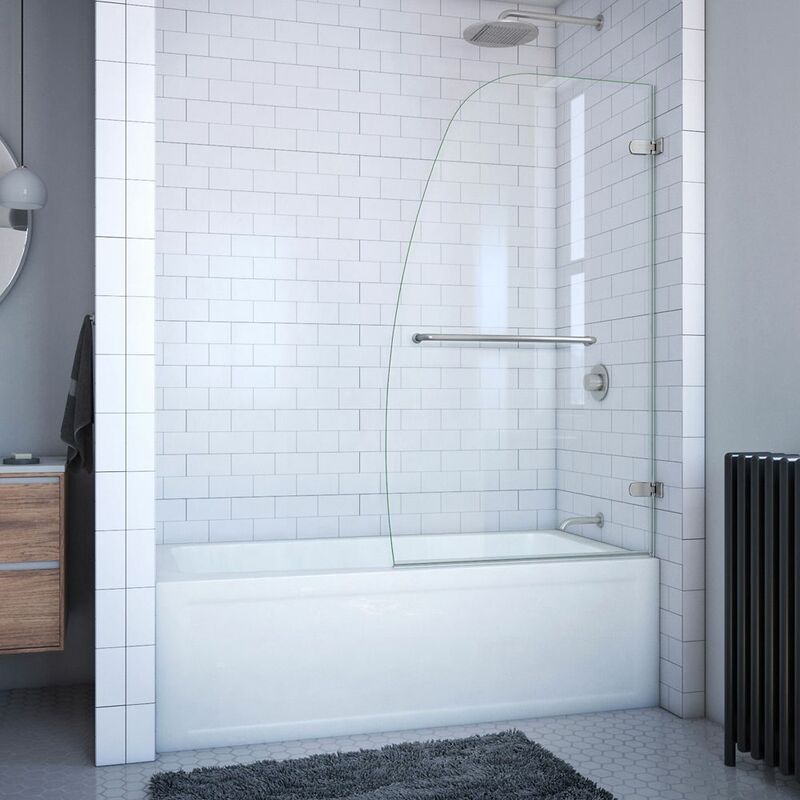 Rated 5 out of 5 by Laura from Easy to install, compliments our new modern tub and tile,... Easy to install, compliments our new modern tub and tile, swings out cleanly for good entrance and exit from tub. Does the door pivot both ways? No. It only pivots out. A great door though. Looks and quality. Quite easy to install. My tub is 58&quot; wide...in the diagram of &quot;product measurements&quot; it says (C-width) is a minimum of 591/2 &quot; opening&quot;? Why? The Aqua Uno is not designed to cover the entire width of your opening. We include the 59-1/2&quot; measurement because that is the most common tub width. It will work great with your 58&quot; opening width. If you have any other questions, please contact the DreamLine Customer Support Team at 866.731.2244. We are available 8am-7pm EST, Monday through Friday, and Saturdays from 9am to 5pm EST and will be happy to answer any questions you may have. You may also send an email to support@dreamline.com. Thank you for considering DreamLine!